3. Squire Stratocaster Mini with new Bone Nut and Fret Dressing/Setup. Squire Stratocaster Mini with new Bone Saddle. Really? 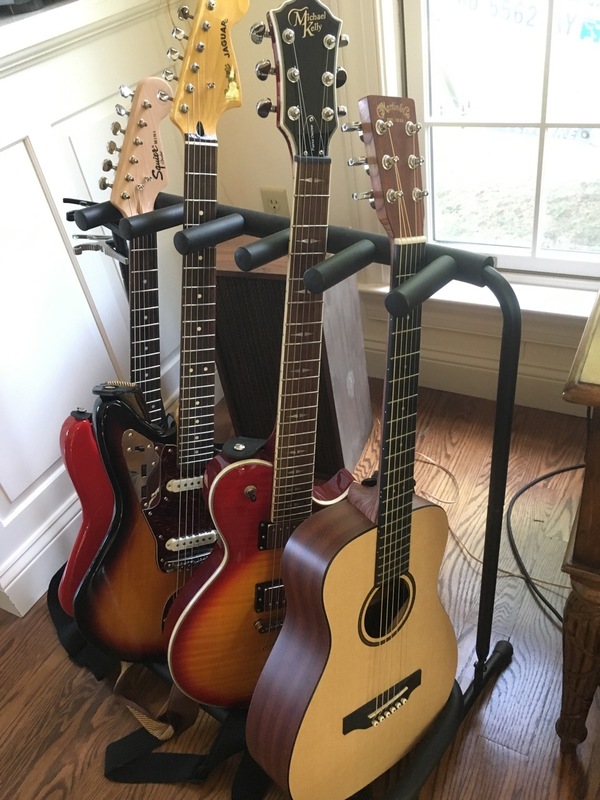 Isn't the bone saddle more appropriate for an acoustic? I think ANYTHING is better than the cheap plastic saddle on the Squire Mini. And the stock Jag Saddle would not accept larger strings. That said My Luthier is an Acoustic Guitar builder and does prefer a Bone saddle. I followed his advice and am pleased. YMMV. I spent my teens in York and my only goal was to get the heck out of there. Godspeed. Looking at the pics, I'm pretty sure he means nut. sorry folks NUT replaced on both electrics w/ BONE NUT. The one on top clearly isn't a shortscale, but I wanted a quick size comparison. Fender Japan MG73-CO, candy apple red. I'm skinny and I have small hands, so I'm really digging how comfortable to play the Mustang is. It's also nice to have an instrument that doesn't point at the floor when I stand up. 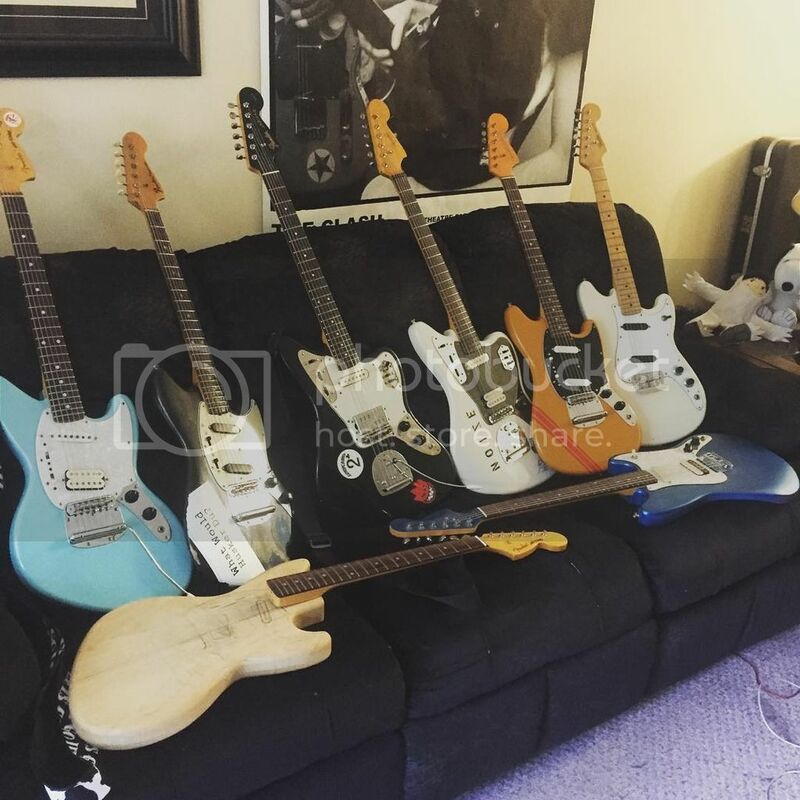 Nice couple of guitars you have there, but particularly the Fender. Welcome! v nice collection. i had a recent reawakened hankering for a starcaster. 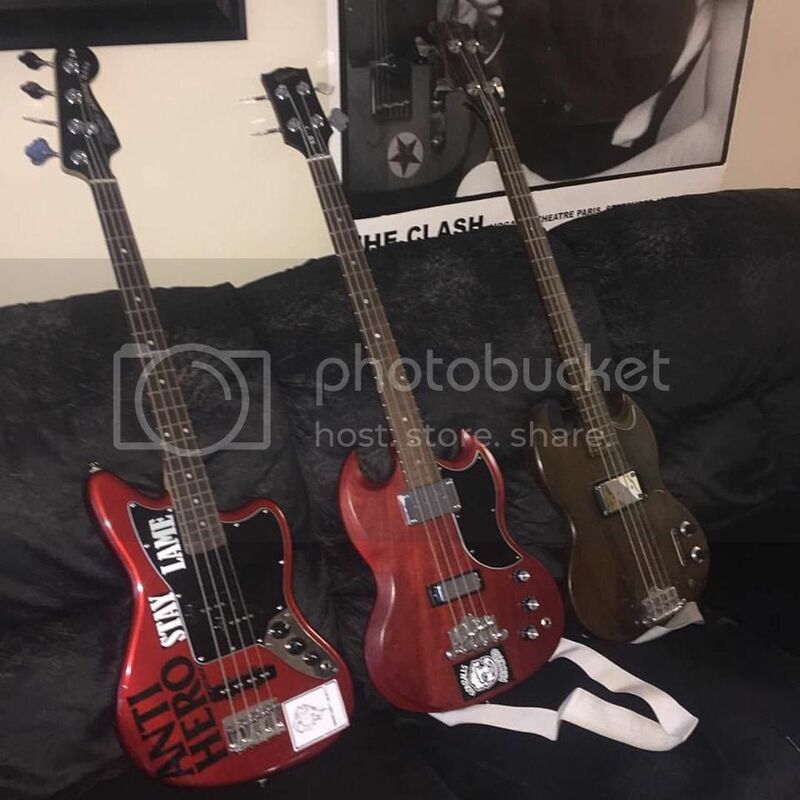 Aye, nice bunch of guitars. 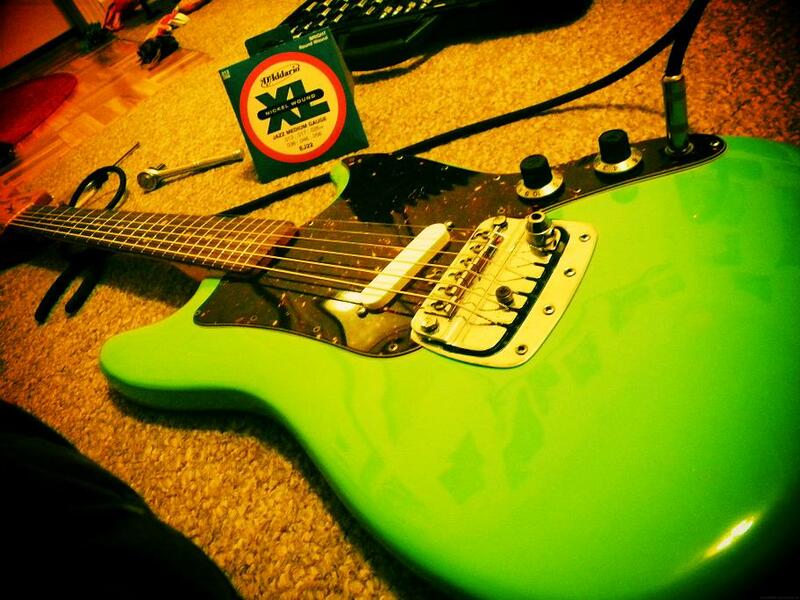 What do you think of the Starcaster Noisy Cat? I was quite excited when they announced them (and the Coronados for that matter) but then got a bit put off by the TOM/stop bar. Still wouldn't mind giving one a go at some point though. Yeah I like it; it's something very different to the other three. The Chinese workmanship on the body and neck is great � definitely a step up from Indonesian Squiers. I've put 1meg pots in it as well as the Mojo WRHBs, so it's really clear and bright. You can pick these guitars up pretty cheaply on the used market nowadays too. 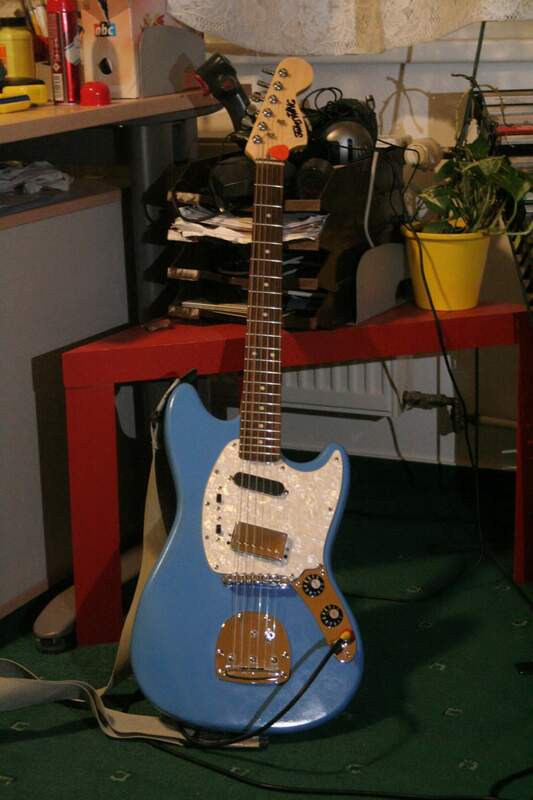 JagStang Project: Robert(original) body & 1996(?) neck, Cyclone Project: Robert (original) body/repaired body & conversion Jagmaster neck hard tailed to adjust for new scale length. I don't think I've ever seen your full collection before. I'm really jealous. its been pretty stagnent for the past five years.. but before that i was trading a lot so i didn't really take many group shots..
i kind of regret it..